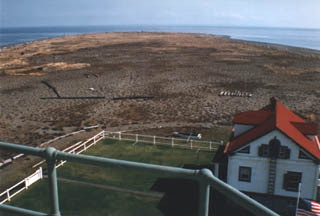 The New Dungeness Spit derived its name from Captain George Vancouver who named it after Dungeness Point on the rugged coast of England where a lighthouse had stood since 1746. 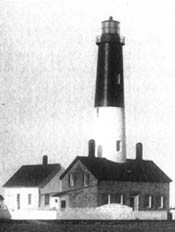 In 1850, a Congressional Act provided for a lighthouse at New Dungeness. 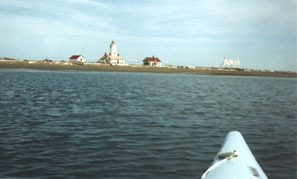 Several years later funding was provided for lighthouses: Willapa Bay, Cape Flattery, Smith Island and New Dungeness. Construction was completed on all four in 1857–58. New Dungeness was the first to light, on December 14, 1857, making it the first to be lit in the Strait of Juan de Fuca-Puget Sound areas, and the second to be lit north of Cape Disappointment. New Dungeness and Cape Flattery are the only two lighthouses surviving, with New Dungeness the only one open to visitors. New Dungeness Lighthouse was originally one-sixth of a mile from the tip of the spit. It now sits approximately one-half mile from the tip. The spit continues to grow. In 1868 eighteen Tsimshian Indians, (men, women & children) were massacred by the Clallam Indians as they camped on the spit. One pregnant woman escaped and was sheltered by keeper Henry Blake. The son of this woman returned years later to visit the lighthouse. 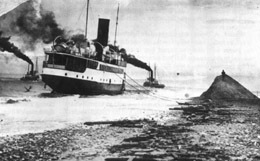 Even with the light and fog bells and horns, the spit has quite a history of shipwrecks, including the bark Christopher Mitchell, the Washington Libby, the R.K. Ham and the steamer Sioux. In 1895 funds were requested to build a new dwelling. It was built for $4500.00, a Cape Cod style two story house having fine woodwork, three bedrooms and ample space for family living. The date of completion, 1904, is carved into the front of the porch roof. In 1915 the spit attracted national attention when President Woodrow Wilson decreed it to be a Department of Agriculture wild bird reservation with access by the public permitted. Today, it is the Dungeness National Wildlife refuge, managed by the US Fish & Wildlife Service. In 1927 the tower was reduced from 100 feet to 63 feet. This was done due to deterioration from weather erosion and/or reverberations from Canadian artillery practice, depending on the source consulted. The lens and lantern room from Admiralty Head Lighthouse were installed, giving New Dungeness a fourth order Fresnel lens. The original bricks which were removed are still found scattered about the site. In 1976 the light was changed, replacing the Fresnel Lens with a rotating six sided bulls-eye prism. This date is etched in the wall at the bottom of the tower on an inside wall. In March of 1994, the Coast Guard permanently withdrew the last keeper. The Coast Guard planned on maintaining the light and Aids to Navigation, but planned on boarding up the buildings. Experiences of other lighthouses suffering this fate have shown that vandalism soon follows, causing widespread damage. 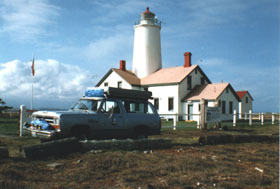 The New Dungeness Chapter of the United States Lighthouse Society was formed on September 3, 1994 and obtained, with the aid of the USLHS, a five-year renewable lease with the Coast Guard. Since this time, the New Dungeness Chapter has manned the lighthouse. The chapter adopted, as its mission, the following goals: To Protect, Preserve and Man the lighthouse. Two or three couples (or some combination of 4-6 adults and a few children) are transported out every week at the lowest tide possible along with enough supplies and personal effects for a week. While out at the lighthouse for their week, the keepers have duties, including cleaning, repairing and maintaining the buildings and keeping the lawns in good condition. The keepers are also responsible for conducting tours to those stalwart persons who are able to make the walk out. Many visitors also come out by small boat or kayak and, after beaching their boats, wade ashore to visit.